Erected in loving memory of my father. 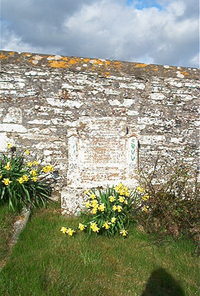 Alexander Miller died at Bignold Hospital Lybster as the result of an accident 26th June 1945 aged 72. Wife Agnes Elliot Lyall died at Knockinon Dunbeath 13th June 1931 aged 58. Also their children William, James, Janet and Charlotte who all died in infancy. Daughter Alexandra Miller (Bunty) died 1st February 1979 aged 65. Charlotte Gunn died 10th August 1972 aged 93.